With Paul Pogba restored to the starting line-up and Romelu Lukaku named man of the match, Manchester United's 2-1 win over Chelsea at Old Trafford was a triumph for Jose Mourinho. It could prove a turning point in the club's season, writes Adam Bate. Romelu Lukaku had scored against fellow former clubs Everton and West Brom already this season, but his calm finish against Chelsea felt far more significant. It could prove a crucial moment in his Old Trafford career. After scoring the equaliser, he also provided the assist for Jesse Lingard's winner and was noticeably invigorated by it - one late driving run epitomising his afternoon. Doubts over Lukaku have remained even as the goals have gone in this season, particularly given that, prior to Sunday, he had played 10 games against the top eight teams without scoring once. Something had been missing but the hope now is that this can be the catalyst. Lukaku showed that he doesn't need lots of chances or lots of the ball to make the difference. Alvaro Morata has the pedigree of Champions League finals behind him but Lukaku was the striker on the pitch who people would have wanted in their team. He can build on this. But Lukaku's display was just one of many reasons why this was a huge day for United. It is not just that the victory lifted them back above arch-rivals Liverpool and into second spot again. 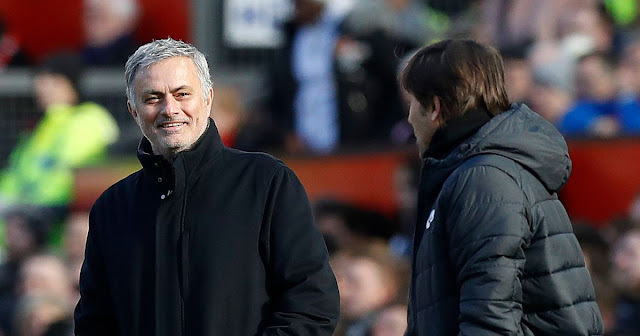 It also opened up a six-point gap to Chelsea in fifth and in doing so offered proof that Jose Mourinho's way can still win these big matches - something that has been a concern. United did not even score in their games away to Liverpool, Tottenham or Chelsea. And while they did beat Tottenham at Old Trafford, the loss there to Manchester City was seen as more revealing. So when Willian opened the scoring by cutting through the United defence and blasting beyond David de Gea, the murmurs of discontent were palpable. Even after the equaliser, the sight of Anthony Martial sauntering off when substituted in favour of Lingard was indicative of the approach. United were anything but reckless in turning this game around but turn it around they did. It was a controlled performance, the manner of it reassuring Mourinho that his methods work. Knowhow not gung-ho. They will need to win big games like this and they will need to believe that this way works. There is not just a daunting trip to the Etihad Stadium and the prospect of an FA Cup run to come, but also the Champions League second leg against Sevilla. Tougher tests ahead. The search for balance goes on but perhaps there are signs that they can find that too. Scott McTominay's presence alongside Nemanja Matic with Paul Pogba ahead of them looks a lot more like the robust and powerful midfield trios for which Mourinho was once famous. After getting 73 minutes together in Seville in midweek, this was the first time that the three men had started a game alongside each other. It was encouraging. Pogba's role in the United team has been a concern in big games, particularly when used in a midfield two, but this is a system that affords extra protection. There are still three attacking players ahead of Pogba so the threat remains, especially now that Martial has been restored to the left with Alexis Sanchez given freedom to get closer to Lukaku. A long-term solution, perhaps? McTominay cannot expect to play every game just yet, of course - Mourinho has been clear about that. But beating the reigning Premier League champions will reassure many that this is a system that can succeed. If so, it could also help to lance the boil of the tension reportedly building between Pogba and Mourinho too. The manager's Manchester United project is still in the balance. There is work to do to secure a top-four finish. The cups could go either way. But this was a big moment. A big match won. Pogba's role clarified. Lukaku playing a decisive role. It was all that Mourinho could have hoped for and could yet prove a turning point at this key phase of the season.